PW called the first of Sally Gardner's Tales from the Box, The Countess's Calamity, a ""diverting and clever fantasy, sure to attract a following."" 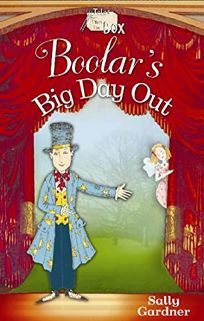 In her second in the series, Boolar's Big Day Out, readers return to the park with Mr. and Mrs. Mouse and the five dolls in the box next door. Boolar, tempted by the allure of starring in the puppet theatre, ultimately realizes who his true friends are. Gardner's intriguing illustrations set her characters against photos of three-dimensional backgrounds.